Hebron – 22/6/12 The Israeli Occupation Forces (IOF) used tear gas and sound bombs to repress a large solidarity march to the village of Susia, in the hills to the southeast of Hebron. The village has experienced multiple cases of house, tent and cave demolitions, leading to the displacement of more than half of the village’s residents, as Settlement associations, who consider the village to be illegal, pressure the IOF to clear the area of Palestinians. 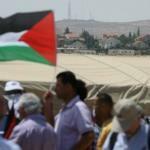 Those that participated in the demonstration, which started from the village, marched in the direction of the nearby Illegal settlement of Khirbet Susiya, established in 1984 at the expense of the Palestinian villagers. Hundreds of citizens of the West Bank and international activists continued the march into the afternoon when Friday Prayers were held on the edge of the land stolen by the settlement. The occupation forces set up a human barrier to prevent access to Khirbet Susiya and used stun grenades and gas, and to beat and arrest a number of participants but were thwarted by other demonstrators. The participants raised the flags of Palestine and banners and chanted slogans in Arabic, English, Hebrew - calls for an end to the occupation, which they called colonial and racist, and others condemning the wall and against the establishment and building of settlements. Popular Resistance and Human Rights activist Hisham Sharabati said that the Israeli Supreme Court had given the residents of Susia until Sunday to contest the demolition orders, issued on the 12th of June, which affect around 60% of the houses and inhabitants of the village. Sharabati added that great efforts are being made through legal, political and media campaigns to thwart the planned demolitions, which will amount to the ethnic cleansing of Susia and other threatened villages around it. Hebron Defense Committee activist, Anan Da’ana, said that the demonstration in Susia is part of a wide variety of resistance actions against the Zionist policy of transfer which aims to clear Area C, more than 60% of the West Bank, of Palestinian communities. Da’ana praised the Palestinian participation in committees and in popular demonstrations which emphasize national unity.